World War II marks the beginning of modern commando warfare. Focusing on a way to effectively counter guerilla operations, the Germans employed a decapitation method in their attempts to track down the Yugoslav partisan leader Tito. Lack of manpower and the prospect for immediate results made this option very attractive to the German High Command. In the sixth year of the war, with ever increasing casualties in 1944 the German armed forces were thinning out non front line units and the manpower shortage became a dominant challenge. After good commando experiences with the regular paratroopers, the Waffen SS had started to set up its own airborne division (500/600 SS Fallschirmjäger) in autumn 1943 and after basic infantry training the men conducted special parachutist training in Sarajevo. Its first deployment mission was “Operation Rösselsprung” (“Knight’s move”) which will be analyzed in the following and then lessons will be filtered out that retain its relevance for modern warfare. The partisan activity in Yugoslavia was spurred after the campaign of 1941, the intensity fluctuated but never ceased completely. Countering the insurgency was further complicated by the nature of the uprisings. In fact, the region saw numerous groups and factions along political and ethnic lines fighting against the German and Italians and against themselves. Tito gained more and more support by the Allies as he was simply the one “killing more Germans”. Intelligence became vital in order to find local allies in a terrain and a society that favored the strength of insurgent groups. Numerous German attempts of rounding up the enemy in big pockets failed as the Communists guerillas under Tito evaded destruction every time. Large cordon operations (e.g., Operation Schwartz) had more than 50,000 German troops plus auxiliary forces and aircraft deployed and still Tito slipped through with 10,000 of his men. Operation Rösselsprung marked the 7th large scale attempt to put down the Communist insurgency. Due to the constant lack of manpower and with an Allied invasion in France in spe, Italy eliminated, and the Russians standing in Hungary, a decapitation method was tried this time. The rationale was that paratroopers would have the benefit of surprise and mobility over pure mass. It can also be seen as a continuation of Schlieffen’s ideas and the Cannae myth this time by a “vertical envelopment” (Kurt Student). 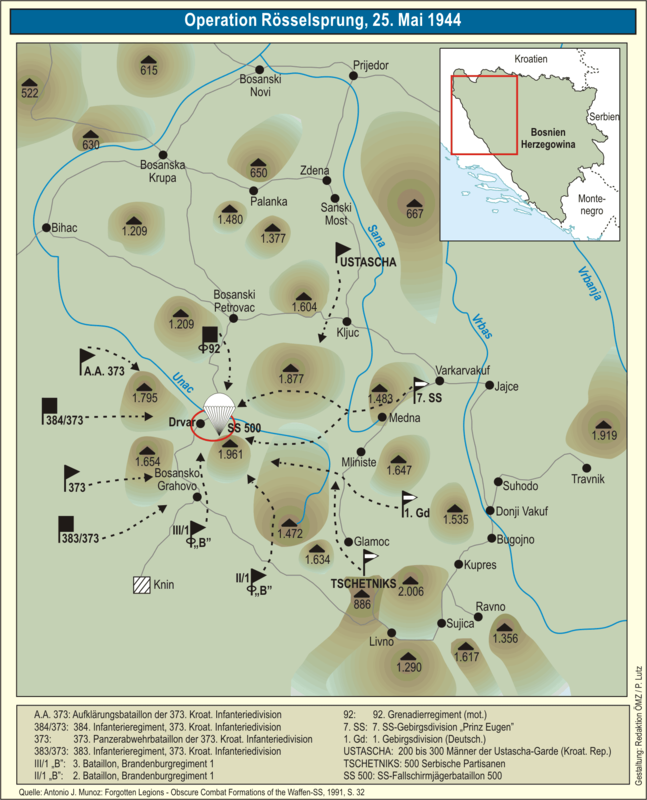 On May 9th 1944 the German High Command ordered the participating units to prepare to clear the area of Partisan forces to further deny Tito access to Serbia and in the best case to deprive him of his basis in Bosnia, due to which he already reached an organizational level far beyond a “guerrilla horde”. In addition, the Brandenburger Special Forces were attached to the SS paratroopers, which led to some tensions between Wehrmacht and SS and hampered unity of command. The SS unit consisted of former criminals or detainees on probation, hence, risk taking and the willingness to accept casualties has to be seen in a different light. The German military intelligence was able to decipher partisan transmissions and to detect Allied air markings in Drvar, consequently they could amass where Tito’s base was located without directly pinning down the location of his cave outside of the town. In the town it was expected to encounter 800 partisans and 200 civilians, further a 350 personal guard of Tito and the 100 men strong officer’s school were in close distance, also the troops based close to Drvar were estimated at 12,000. Double agents among the Ustashe and Chetniks made the general plan of an assassination known to Tito. In addition, the aircraft reconnaissance flights and the troop concentration were noted by Communist spies, some documents were captured and “pillow chat” and leaks did the rest, without the ULTRA secret being of any help. However, the insurgents did not know anything about a planned airborne drop and were caught completely by surprise. Tito was supposed to have been in the town of Drvar or the surrounding mountains; yet, the Germans did not know where exactly he was located, a factor that determined much of the operational development and success. In fact, the bombings before the raid and increased air activity led the Allied advisers to propose him working during the day outside the village in the cave to be safer in case of aerial attacks. The operational plan outlined a landing through jumps and gliders of around 600 men in the first wave. Due to a lack of transport capacity a second wave of 200 men was necessary. In support, ground troops mainly of 7 SS Panzerdivison “Prinz Eugen” should move separately to the Drvar-Bosanski-Petrovac area encircle the enemy and support the commandos, also Luftwaffe aircraft were planned to provide assistance. The airborne forces would seize the town, try to gather information where Tito was, by any means, and defend its positions until reinforcements would arrive. The first wave consisted of 340 men flown in by gliders and the same amount by parachutes, a second wave consisted of 220 parachuters. The focal point of the operation was Tito and his highest staff, as soon as knowledge of their location was known, all units should move immediately and ruthlessly in this direction and capture them, if possible alive. Therefore before the mission all participants were shown his picture. On the 25 of May 1944 at 6.30 AM the shelling started. During the drop, the paratroopers sustained heavy fire from small guns and many were killed as the gliders missed their intended landing zones or crashed, amounting to many more than the 10% pre-landing casualties that the Germans had expected. From 7 AM on, the commandos fought their way into the center of Drvar, where the whole town picked up arms to fight the Germans. The Germans enjoyed superior firepower, better tactical training and flexibility, and were able to capture the town in fierce house-to-house fighting around 9 AM, capturing 400 prisoners which they interrogated extensively to find out where Tito was (this, of course, took a lot of time). Meanwhile, the German commanding officer noticed heavy defensive fire at the foot of the hills preventing the commando units to cross the river. Consequently, Rybka noticed that they must have been defending something important and redirected all efforts in this direction, being able to seal the cave entrance off by laying heavy fire on it. At the same time, the partisans stationed outside the town staged a counter-attack and “hugged” the German forces to prevent the Luftwaffe from unleashing its full effectiveness. At 4 PM, Drvar came under constant attack and the Germans were meanwhile denied access to the cave by heavy defensive and mortar fire. Two hours later Rybka ordered a general retreat to the town’s cemetery and he was wounded and had to be flown out with the light reconnaissance aircraft that was supposed to fly out the captured Tito. At this point, the German units came close to being overrun and decimated by the mortar fire, especially as air support ceased with nightfall. Additionally, the message that Tito had escaped was spread at 3:30 AM, inflicting a heavy blow on morale. At the same time, ammunition was getting low and only 250 out of 874 men were still combat effective to repel the attacking partisans. Only the partisans’ caution in the face of German firepower prevented complete disaster. With sunrise, the Luftwaffe close air support picked up again and “Prinz Eugen” made its way to relieve the surrounded commandos. However, the “relieving ground forces had been stalled by partisan defensive efforts and in some case counter-attacks. Demolished bridges had to be spanned before the planned link-up could take place.” In addition, von Thun-Hohenstein criticizes the fact that the advancing units were “glued” to the main roads, which reduced their flexibility in chasing down partisans and increased their vulnerability to Allied air attacks. The arrival of the SS ground forces and mountaineers on the second day led to a new offensive, Tito, however, was gone and the Germans could only capture his newly made uniform. The losses were tremendous. Out of 862 paratroopers only around 200 men were fit for redeployment. The battalion was renamed and had to be reconstructed basically from scratch. Tito escaped with British help to Bari and could continue his movement, after a short interruption, from Vis. Consequently, the operation only shortly interrupted his direction of the insurgency, but had no effect on the insurgency as a whole. The partisans reacted quickly and shifted large amounts of troops to envelop the German troops, using their knowledge of the terrain and support of the people. However, a decisive attack on the cemetery in Drvar would have led to the complete defeat of the SS airborne troops. While the operational victory can be seen on the German side in penetrating the area and “clearing” the ground and capturing some materiel, strategically Tito created a myth of invincibly by surviving the raid that was aimed at capturing or killing him. However, given the great losses, this airborne operation was a pyrrhic victory like the landing on Crete. Eyre sees the main reasons for failure in intelligence blunders, stating that the force-to-space ratio was mismatched, the area was not sealed off properly, contingency planning was insufficient, and the “Nazi disease” of inter-agency rivalry and poor cooperation. A larger cordon around the expected target would indeed have reduced Tito’s chance of escaping unharmed. Yet, one has to consider that the direct action mission was undertaken due to a lack of manpower on the German side, so a larger cordon would have been harder to conceal and would have been even less supportable given the forces available. Miscommunication was definitely a factor in the failure. Among the agencies, cooperation was poor during planning. The second wave could have been directed on top of the cave to seal Tito’s escape route off (following the principle that the target person is where most resistance is met). In retrospect this may seem easier said than done in the fog of war, but the contingency planning aspect plays in here too, as the “unexpected should not be unforeseen.” The preparation phase also had its problems due to the outdated German intelligence and general lack of support from the population in this remote area. The raid showed that direct action missions rely on speed and good intelligence, surveillance, and reconnaissance (ISR) before the mission. Every movement is very difficult on the ground, as mobility is higher while still in the air, thus the cave being even only some miles away created a major hindrance to successfully completing the mission. Rybka already expressed doubts in the mission briefing about Tito actually being in Drvar, so his reluctance to change the operational target was also due to imprecise intelligence and his schematic command. The Luftwaffe fulfilled its purpose by giving vital close air support against unexpectedly strong and numerous partisans in the surrounding areas. The supply problems arose due to prolonged combat without decisive results. Consequently, it is also important to note that unlike guerillas, the paratroopers did not enjoy the benefit of retreat when meeting resistance. Finally, the question remains if a successful attempt would have turned the tide in the Balkans. During the end of Operation Rösselsprung, the Allies landed in Normandy, rendering the peripheral strategy that was in Churchill’s mind unlikely. Also the collapse of the Army Group Center and the Romanian front threatened to cut off the German divisions on the Balkans and made troop relocations necessary. The main question is if decapitation of the highest leader plays any significant role in insurgencies. The experience from Iraq shows that targeting the mid-level leaders had a significant effect on the fighting ability of the insurgents. Likewise, Tito had capable junior leaders in his staff (think of Pijade, Kardelj and Dilas) and the insurgency was already in its Maoist conventional phase, thus, hard to stop by decapitation. Rösselsprung also showed the sensitivity of ISR missions conducted before the direct action operation, as it may hamper secrecy efforts. Additionally, large scale cordon movements are difficult to conceal, especially with bad infrastructure and in a hostile environment. To get better intelligence, local assistance would have proved very beneficial to the German actions or infiltration beforehand. In addition, the targeting of the population further diminished their chances of success in gathering information. The “ink spot” model the Germans also used on Crete - pursuing success at the enemies’ weakest spots and keeping their own focal point secret - bears the danger of achieving success nowhere. Without the necessary intelligence however, the Germans did not enjoy the luxury of having different options. Achieving air superiority, securing fire support and supply assistance, as well as shielding the theatre of operations, remain vital tasks in modern warfare. Also, the exit strategy of the Germans assumed an operational victory which would be followed by converging with the supporting ground forces. As such, the German military’s willingness to accept casualties was far too great and risk-minimizing efforts should always be carefully planned in detail. The contingency planning was poor to nonexistent and was further hampered by inter-agency rivalry. Consequently, this shows that even without political friction, media and a sensitive public, missions based on “a lot of sticks and no carrots” are bound to fail in conflicts that are more population centric, if the civilians are not supportive. Pavlowitch, S. K. (2008). Hitler's new disorder : the Second World War in Yugoslavia. New York, Columbia University Press. Matteo B. Scianna is a candidate in the Dual MA/MSc in International and World History at Columbia and London School of Economics. He is German/Italian and did his undergrad in Maastricht and Vienna Universities. His main focus is European conflicts after Napoleon, Imperialism, the German army, air power and irregular conflicts, and attempting to link the historical case studies to modern security studies and foreign policy/geopolitics. Take it straight from the horse's mouth:"Quel homme, ce Tito!...On ne pouvait faire un pas en Serbie sans danger. Voilà un véritable héros national...À côté de lui, le général de Gaulle était un héros de T.S.F". Hitler to general Antonescu(Souvarine,Staline:aperçu historique du bolchévisme, Paris,Edition Gérard Lebovici,1985,596.). cutting short the list of deployed units, these unneccessary errors occured during editing, so again thank you for pointing at them. Regardng the what if I think it is impossible and ahistorical to compare these time periods. A clear external enemy, the Allies vicotorious all the way and the war time spirit would have served any second rank leaders I named. The Tito myth was only intensifed and of course gained much more strength after 1945/48, not to speak of factors like the economy, developing nationalism etc in the 1980s. My aim was to portray the German plan and shortcomings and the scope of this "study" prohibited additional research, but please provide me with further reading you think worth including. I think it's great that younger scholars are looking into lesser-known COIN studies like Yugoslavia 1941-45 - that one has a lot to teach about how *not* to do it. However, that "what-if?" factor about Tito here is instructive. Given what chaos Yugoslavia fell into after The Old Man's death in 1980, I find it hard to see how the Partisans could have gone on so well in the last year of WWII - as they surely did - without Comrade Walter. Here, decapitation, which so nearly happened, might have mattered a great deal indeed. Moreover, this article is so replete with basic factual errors as to not inspire confidence in scholarly rigor, ie the 500/600 SS FJ was a battalion, not a "division"; and the infamous 7th SS "Prinz Eugen" was a Mountain, not Panzer, Division. Also, the Yugoslav side of this has been written up extensively and, problems with Communist historiography aside, it is informative; good to consult it.